Reporting often gets overlooked, but it is extremely important. It is a valuable part of preparing a project to ensure focus on the right targets. Once a project launches it is best to continue to track and report results so necessary changes can be made to continue effectiveness. Make progress by accurately and effectively reporting and tracking the right goals and information to make your strategies a success. “A BIG thanks to each one of you for all your hard work designing, producing, marketing, and tracking our Summer Camp campaign. 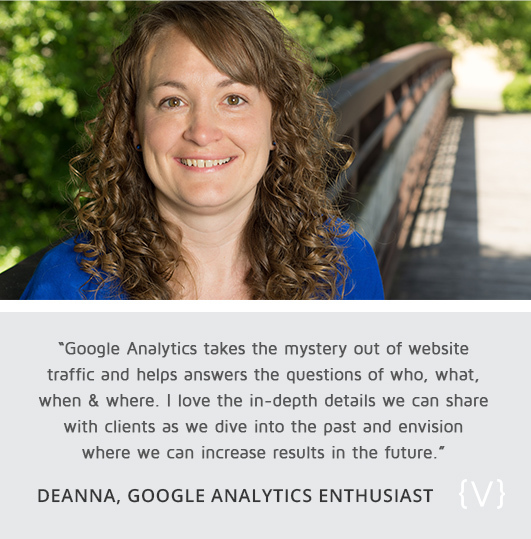 Google Analytics is a great tool for goal setting and reporting. We work with customers to tie into their search engine optimization (SEO) plan, evaluate, and suggest ongoing activities. Google Analytics is an extremely versatile tool that can help you reach your goals and track your progress. There are also custom reports and measurements that we create based on the needs of a business or organization. Some business want to know more about their competition. We can help with competitor analytics and compile a report to help determine your competitive position. Some businesses know what they want to do, but others aren’t as sure. An audit of your current website, social media, online presence or overall marketing may be just the thing you need to make the next steps to reach success. The Vivid Image team offers a fresh perspective on your current position and suggests opportunities.